Irakli Tripolski, the chairman of the board of trustees of the Georgian Public Broadcaster has resigned, citing “biased reporting” of the public TV. Tripolski said that he took the decision after the public TV’s “biased coverage” of the May 26 protest rally of the opposition. Meanwhile, the opposition coalition, which now includes eight parties, held a protest rally outside the Georgian Public Broadcaster on May 27, complaining about what they called the public TV’s biased reporting. After making speeches at the rally, several opposition leaders, including Giorgi Khaindrava, Salome Zourabichvili, Zviad Dzidziguri and Davit Saganelidze, went inside the GPB building and marched into the general director Levan Kubaneishvili’s office accusing him of fulfilling the authorities’ instructions. “Do not talk like this, please tone down rhetoric and talk without emotions,” Kubaneishvili responded. He also told opposition leaders that the public TV allocated total of 39 minutes to the opposition’s protest rally in its news bulletins on May 26. GPB has news once in an hourly and main, primetime, evening news at 8pm. 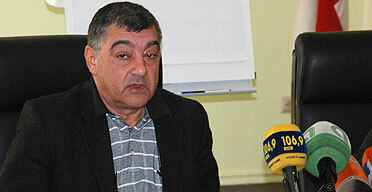 "This TV channel will not come under the influence of any political group," Kubaneishvili added. Before marching into the public TV general director’s office, the opposition leaders addressed a small protest rally outside the television station’s premises in downtown Tbilisi. “What happened in Tbilisi yesterday is unknown for the viewers in the provinces, because the only TV channel which was broadcasting the rally was Kavkasia TV and as you know, Kavkasia is broadcasting only in Tbilisi,” Salome Zourabichvili said. The opposition leaders also demanded resignation of the public TV general director and allocation of at least one hour live airtime for the opposition leaders. The opposition has also welcomed the decision of Irakli Tripolski to resign. “It is absolutely clear, that when such an honest person, fails to work in this television and resigns, it means that the state control and state management have been established there,” Gia Tortladze, an individual member of the eight-party opposition coalition, said at the rally outside the public TV. “As such, all five main TV channels [GPB, Rustavi 2 TV, Mze TV, Adjara TV, Kavkasia TV] were under some influence from candidates and political parties, which was an obstacle to covering all election subjects in a nondiscriminatory manner as provided by law. This resulted in campaign news coverage lacking balance on all monitored TV stations, apart from public TV, with the UNM [ruling party] receiving the most coverage on almost all stations,” the report noted. It also said that during the media monitoring of the last six weeks of the election campaign, public TV devoted similar proportions of its political and election primetime news coverage to the opposition coalition - 18% and the ruling party – 17%. “While the ruling party was given overwhelmingly positive coverage, the coverage of the main opposition bloc was mainly neutral. The biggest share, however, was devoted to the President and the Government (together 32 per cent) with an overwhelmingly positive tone,” the report reads.